Discussion in 'Team Fortress 2 Talk' started by Fragimus_Max, Jun 17, 2011.
Who else thinks the new Hospital map is an updated version of Rock2 from Team Fortress Classic??? I posted this on Reddit, but I decided to come here since I think more of you guys will know what Rock2 is - and of course, this is TF2maps.net. Rock2 was a map in Team Fortress Classic. It involved keycard-oriented mission objectives, and ended with all surviving players being gassed. One of the keycard locations was an office that looked very similar to the doctor's office. DESK... check. FILE CABINETS... check. It's just a bit more themed out than a plain old office. Also, as I mentioned in the above comment, note the barbed wire in the portait of the hospital. * Birds drop health packs when killed. Kill birds to survive poison gas?!? * Also... how about those new LAUGHING TAUNTS everyone's been talking about? To laugh at eveyrone outside of the chamber as they get gassed?!? * Ellen McLaine (voice of the Announcer) mentioned in a video that she recently recorded new lines. Possibly for a new mode?!? Official hospital-themed map? Possibly CTF? DO WANT. No I do not think this. I'd like to see more old TFC remakes, honestly! But I don't think that's what this is. I can almost see as being done like the reverse CTF thing. I wish that would finally be an official gametype. 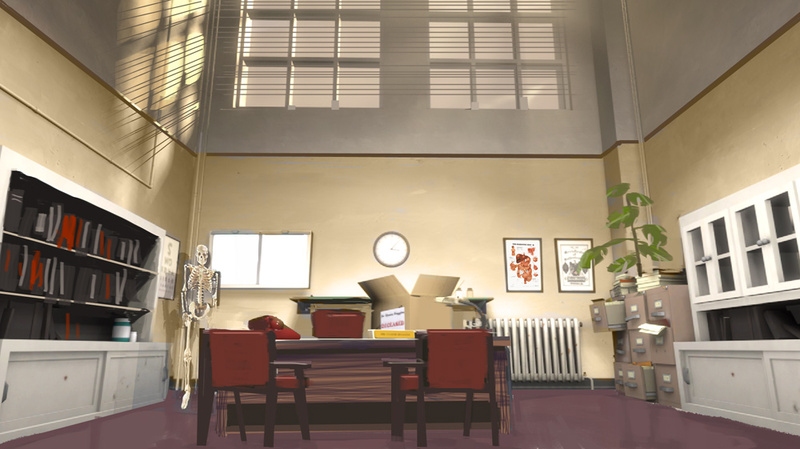 This office concept art? LOOKS LIKE AN OFFICE. If "Raid" turns out to be ctf variant i get to parade around wearing a cape that says "I told you so." I think this may just be Meet The Medic concept art though. If it were the case, I might actually play TF2 again. Might. Possibly. For like a week. Or a day. Either way, I quite loved rock2. You're also making the assumption that those are designs for a map, whi9ch is a huge assumption in and of itself. I'm pretty sure it's the set of meet the medic. Also, the barbed wire and destruction of the hospital look really out of place. Meh, I just want the models. Valve, when are you going to release another "movies" prop pack for the SDK? Preferably one that's actually optimized for real maps this time! As opposed to a jail (as featured in Rock2 Classic), I can see Valve theming this map as a hospital you can't escape. Very much like the WWI-era secret German "torture hospitals" where they would do cruel and unusual testing on patients. Also, there is barbed wire outside of the hospital in that one image. The courtyard in Rock2 was surrounded by an upper-deck with barbed wire. I fail to see how map set inside a hospital is going work in TF2 world, all those images begin Meet The Medic related is much more logical theory, looking how you can access them trough doves on front page. Also, TF2 is not even slightly horrific. That's what i meant about style. Poison gas, torture, testing... none of these fit at all with TF2's comedy-splosion-fun-austin-powers theme. YES, there are mentions of that stuff in the medics backstory, but these are few and far between, and focus on entertaining Noodle Incidents as opposed to the clear and present, well, horror, of being trapped in it yourself. Would there be blood spattered on the walls and corpses? Also, a german guy traps several people in a room and kills them with poison gas. Does that not remind you of anything? Anything that, perhaps, might be best not made fun of? You're ignoring the quite bloody decapitations in-game and outright gore from Meet the Spy. Obviously it's actually all leading into a L4D campaign where you can play as The Team. There's a difference: surely you can see that Shaun of the Dead and Saw are different genres? Gore and horror are different things entirely: see also Bulletstorm, Madworld, etc. Both packed to the ears with blood, but you wouldnt call them horror.